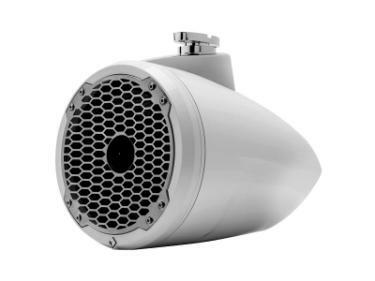 The PM282HW is a white 8" true marine grade speaker loaded into a sealed tight enclosure with a wake board tower clamp. The speaker features a 1" horn tweeter and 8" woofer in a high density poly-ethylene enclosure protected by a stainless steel grille. Both speaker and enclosure are treated with UV inhibitors and conform to industry Salt-Fog standards. The PM282HW is a Punch 8" 2-way wakeboard tower speaker enclosure featuring a high output horn tweeter and marine grade weather proofing technologies. Supplied in all white with a stainless steel sport grille.